Preview: Monday 1 October, 6-8pm, with Performance and After Party from 8-11pm at BAC. 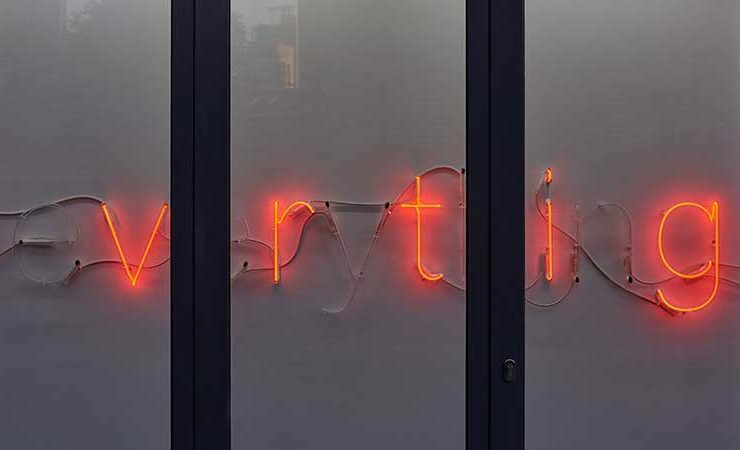 VITRINE is delighted to present a solo exhibition of work by Tim Etchells. Taking cues from its position in a busy public square, Etchells fills VITRINE’s space with a 12 metre-long neon piece that reads ‘For everything that is shown something is hidden’. The letters spelling out the phrase are only alternately illuminated, disrupting the text so that it is only partially visible on first sight. Adjacent to and in a dialogue with the neon work, round the corner of VITRINE’s window space, Etchells presents a series of photographs taken during the protests that greeted U.S. President Donald Trump’s recent visit to the UK. Taken from amidst the marching crowd, the images document the signs that protestors carried, but, rather than the fronts, we see the reverse sides of the placards, revealing the diverse arrangements and colours of crisscrossed tape that holds them together. Although some of these signs were clearly made in haste and others are neater and more efficient, all of them evidence the labour and improvisation undertaken by individual protestors in advance of the march. In contrast to the slogans of the front, which were made for presentation to an audience, the backs of these signs are less considered, and, like a theatrical stage set seen from behind, are primarily visible to those involved in the march itself. In both these works, Etchells considers the relationship between the seen and the unseen. Documentation of the reversed protest signs reveals a procession of abstract drawings whilst in the neon, the language is playfully broken down so that only half is readily visible, a jumble of letters. In each case, we become acutely aware of the mechanics of communication and must draw closer to see the whole story. Etchells works across a broad range of mediums, including neon, text, performance, and drawing. He is the Artistic Director of Forced Entertainment, the world-renowned Sheffield-based group of artists who collaborate to make projects in theatre and performance. Their latest production, ‘Out of Order’ was directed by Etchells and premiered on 27 April 2018, at Bockenheimer Depot, Frankfurt.